The Pañcaskandhaka consists of a list of all factors of reality with their definitions and, in line with Asaṅga's Abhidharmasamuccaya, a succinct summary of Buddhist philosophical scholasticism as presented in the Yogācāra-Vijñānavāda tradition. This small treatise, highly important for the history of Buddhist philosophy, was known until now only through its Tibetan and Chinese translations and is published here for the first time in its Sanskrit original. This critical edition is based on a photocopy kept in the library of the China Tibetology Research Center, Beijing, of a codex unicus found in the manuscript collection of the Potala in Lhasa, as well as on numerous secondary testimonies. It is accompanied by a diplomatic edition of the text, as well as reading editions of the Tibetan and Chinese translations. A short introduction provides basic information about Vasubandhu's work in general as well as detailed information about this unique manuscript. 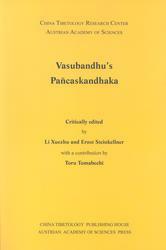 In addition to the text of the Pañcaskandhaka, a text from the verso of the cover page, as yet unidentified, has been edited by Toru Tomabechi and is included in the appendix.